The Steller Sea Lion is the largest member of the eared seal or Otariidae family and are considered as a threatened species. The only natural enemy for the Steller Sea Lion are Killer Whales, and in the Broughton area Transcient Killer Whales are most likely to attack. Humans are also a threat to the Steller Sea Lions through reducing food sources by commercial fishing , being shot, and by becoming tangled in fishing nets. 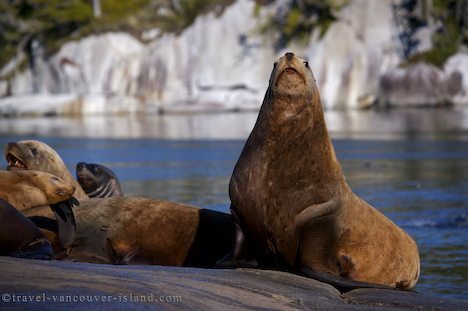 This group of Steller Sea Lions were hauled out on a rocky outcrop at the entrance to Fife Sound in British Columbia, Canada, and were a rowdy and unsettled bunch, as though it was breeding season. Steller Sea Lions (Eumetopias jubatus) in the Broughton Archipelago near Fife off the northern British Columbia coast in Canada. The Steller Sea Lion is also known as Steller's Sea Lion and Northern Sea Lion. Photo of a large Steller Sea Lion hauled out on a rock in the Broughton Archipelago, British Columbia, Canada.